Tropical rainforests are the biggest defense against global warming, absorbing 50 percent more carbon than other kinds of forests. Yet they are disappearing at a rate of about 11 million hectares a year. Yeon-Su Kim, a Northern Arizona University ecological economic professor, is researching how economic incentives may slow the destruction of these important carbon-storing ecosystems and decrease the amount of greenhouse gases released into the atmosphere. “We have a way of helping rainforest communities while slowing the process of global warming,” she said. This summer she is developing a partnership between NAU and Indonesia’s University of Mataram that involves teaching sustainable forestry, biodiversity and ecotourism, along with conducting climate change research. Kim also is studying the success of community forests where villagers can reap the benefits of the rainforests by gathering the bananas, cacao, coffee beans and other products that grow there naturally without cutting and burning trees. She points to the postcard-perfect Indonesian island of Lombok. 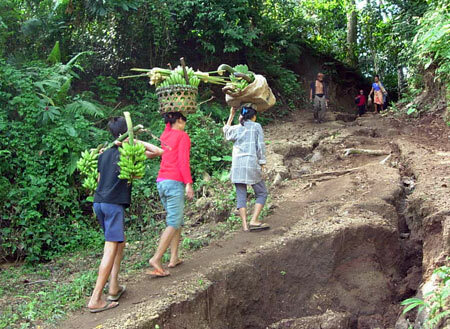 Not only is it known for pristine tropical beaches, it is also recognized internationally for its concept of a community forest whose guardians receive payment for managing the watershed for a city downstream. Indonesia is the third largest tropical forest country and it contains half of the world’s tropical peatlands. These wet, deep thick layers of organic matter have accumulated for thousands of years and hold a lot of carbon. “As Indonesia’s peatland is being destroyed, there is a massive carbon release,” she said. So much so, Indonesia has become the third largest producer of greenhouse gas emissions in the world. It’s only behind the United States and China, where greenhouse gas emissions are tied to economic development from vehicles and industry. Kim’s goals include increasing the number of Indonesians pursuing higher education in the broad spectrum of sustainable forest management as well as promoting global involvement among NAU students.